I've been digging through my blog archives and found this post on the addition of Tooney to my merry family. Dogs really have personalities of their own. Tooney is my protector. Last night I was working late into the night. I needed an energy snack, so I went to make some popcorn. When suddenly the alarm went off. Holy CRAP! I totally freaked. I turned off the alarm so not to go deaf, ran back to my studio and grabbed my box cutter. Tooney was completely calm which I found reassuring. She has alerted me to break ins in the past and stood her ground scaring off intruders. But even so, it was late, my adrenalin was turned on high and I was freaked. I called 911. The police came and did a check around my house. When I slammed the microwave door the sound vibration set off my alarm was the assumption. I do live with a good security system, complete with cameras and two ferocious papillons. Here is the post on how Tooney joined my family. Last month (9/2012) our beloved Jack passed away. He was sitting at my friend's feet begging for a corn chip when his little heart stopped. He shuddered and then fell to his side. By the time we got him to the vet's office, he was already gone. He was a patient pooch, putting up with the shenanigans of Josie who loved to grab him by the tail and yank him around the room. She literally dragged by his tail. Neighborhood children learned to be respectful and only a privledged few did he allow to pick him up. Jack was the man of the house - all 10 lbs of him. Josie went into severe mourning. Though she never liked me leaving the house, she now howled and cried when I did. Her newest nickname became Glue Dog as she was always by my side. The first week she'd run in the backyard looking for Jack, pawing at the garage door to see if he was in there. Once she accepted he wasn't returning, she moped around the house with little energy for anything. 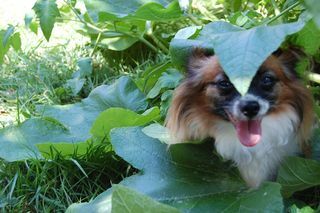 Josephine is so tiny she hide under the squash leaves for shade. What a goofball. Enter Tooney. After a month of moping, I couldn't take it anymore. Josie needed a 4 legged buddy. Every evening I combed through Petfinder.com looking for an adult female, preferably a schnauzer or papillon, that we could adopt. Two weeks ago I spotted Tooney and that was that. My daughter and I adopted her from the South Suburban Humane Society in Indiana where she had been left as her previous parent was sick and could no longer care for her. Josie was all excited until Tooney chewed through every single one of her toys in under two hours. She became even less thrilled when Tooney stole her rawhide chews. But after two weeks, she's decided Tooney is pretty cool. We now are a house of papillons. Beware of small dogs!